It’s been 4 months since my last post and I’ve had many people asking me if I actually finished the rocking chair. Well everyone can rest easy, as I did in fact get it completed in time for Baby E’s big arrival. Lucky for me, he decided to stay in the oven for nearly 2 weeks past his due date, which gave me just enough time to get everything done. Since all of the assembly was finished, it was time to prepare every surface on every part of the chair to receive the finish. This meant hours and hours of sanding through progressively finer grits of sandpaper, until every surface was silky smooth. Sanding is definitely not my favorite part of the process, but putting in the time and effort pays dividends when it comes to a quality finished product. So I cranked some tunes and went to town with the random orbit sander. After the sanding process was complete, it was time to literally leave my mark on what could now be called a legitimate piece of furniture. A while back, I had ordered a custom electric branding iron, so I decided to use it to brand my name onto the bottom of the rocker seat. While the branding iron was heating up, I clamped some scrap boards to the bottom of the seat, which would be used to ensure that the branding iron would stay steady and square while I pressed the iron into the bottom of the seat. After a little experimentation on some scrap wood, I went for it and branded the bottom of the seat. Thankfully, my plan worked and the brand turned out great! After some light sanding to clean it up, here’s a picture of what it looks like. After cleaning up the brand, I was finally ready to start applying the finish. But what finish to use??? There are literally hundreds of different types, brands, techniques, etc. to choose from and the last thing that I wanted to do, was to screw things up on the final step. I spent some time experimenting with several different types of finish on some scrap pieces of wood, but ultimately decided to use three coats of Sam Maloof’s Poly/Oil blend, followed by two coats of Sam Maloof’s Oil/Wax blend to finish it off. After the countless hours of planning, measuring, cutting, gluing, sculpting, and sanding, it was awesome to see the color of the walnut change from a dull gray to a brilliant deep brown color as I wiped on the first coat of finish. Picture of the completed rocking chair with the last coat of finish applied. I’m super happy with how the sculpted seat turned out. The extra time and effort that I put into color and grain matching the three boards that I used to make the seat slab really paid off. Here’s a view of the underside of the seat. If you look closely, you can see the brand in the center of the seat. And here’s the rocker in the nursery; ready and waiting for Baby E’s arrival. The rocker looks absolutely perfect next to the dresser that Katie’s Dad made for us. Paul did an amazing job and we love that our baby gets to be surrounded by pieces of furniture that were made by his family with lots of thought and love. And finally… after 20 hours of labor and a natural birth, we welcomed Hudson James Evangelisto into this world at 3:11 p.m. on November 15th, 2016. He was born a healthy 8 lbs. 3 oz. and 20 inches long. I can honestly say that it was both the most terrifying and the most amazing experience of my life. Words can’t express how incredible it was. I’m so grateful for my amazing wife for giving me this beautiful baby boy, who has forever changed our lives in such an incredible way. I am very much looking forward to watching him grow and raising him with Katie. God has truly blessed us and we are thankful every single day. This is one of my favorite pictures because there’s so much love and joy packed into it. Plus, the somewhat uneasy look on George’s face is priceless! About a week and a half after Hudson was born, we had a photographer come over for a newborn photo session. 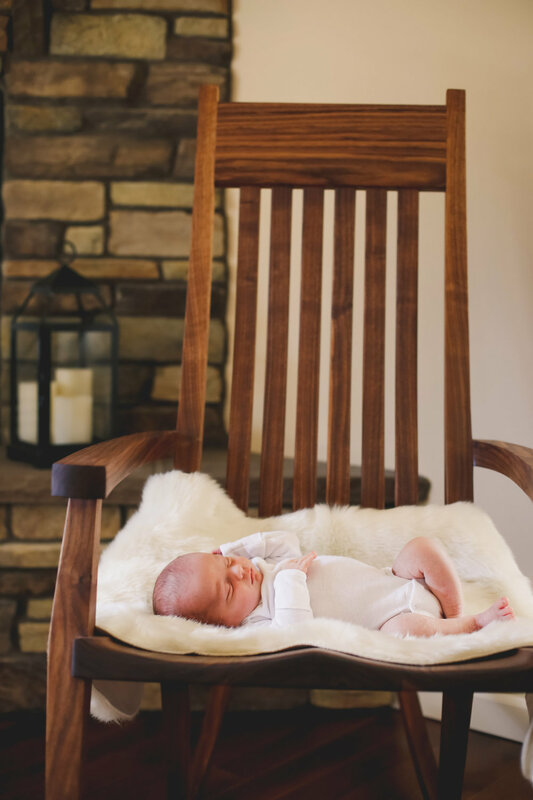 We took the opportunity to get some precious photos of Hudson on the new rocking chair. Here are a few of my favorites. 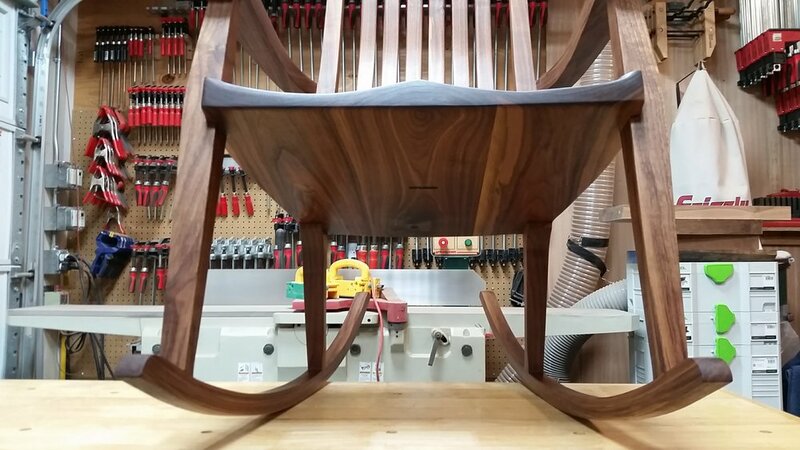 From start to finish, it took me just over seven months to complete the rocking chair project. Granted there were some breaks in the middle, but 7 months overall. I have no idea how many hours actually went into it, but I can confidently say that it was a LOT. That said, I’d do it all over again in a heartbeat. 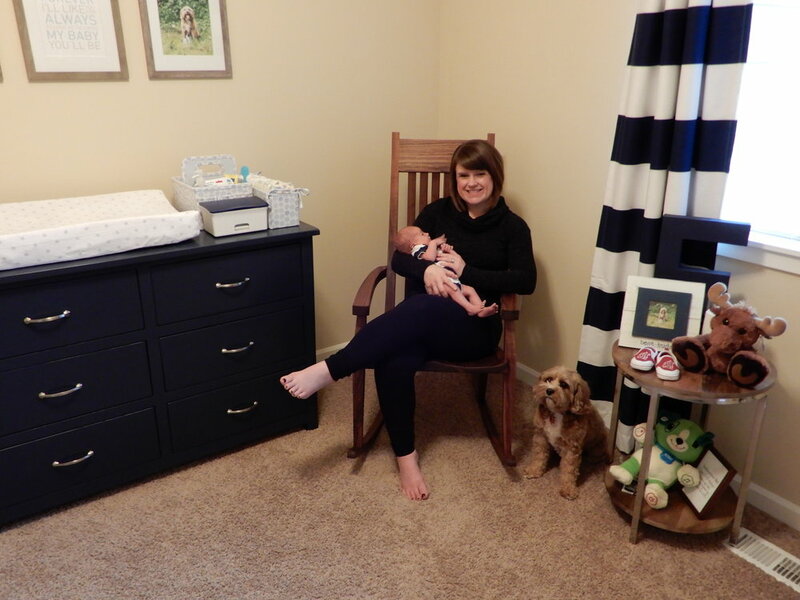 Walking by the nursery and seeing Katie holding our baby boy, while rocking him in the chair that I built for them with my own two hands, truly fills me with so much pride and love. I could have written this post three months ago, but kept finding myself with a bit of writer’s block and making excuses to put it off. 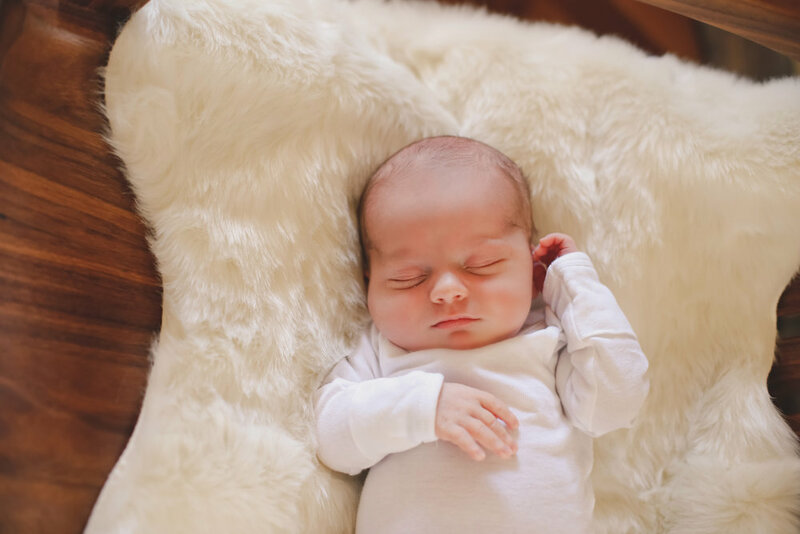 Yes, life has been drastically different and much busier with a newborn in the Evangelisto household, but I don’t think that’s what was keeping me from writing this. 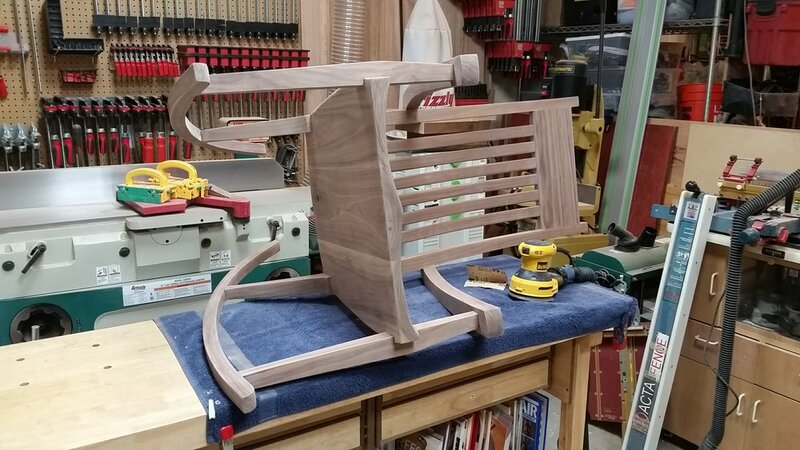 I really enjoyed the process of making the rocking chair from scratch, so it felt like writing this post would mean that the process was truly over. I think that I got so much enjoyment out of it, that I didn’t want to see it end. Eventually I realized that it was just this single project that was over and that my furniture making is only just beginning. I know, without a doubt, that I will make more pieces of furniture and I plan to document those future projects on WoodshopBuilt.com. In fact, over the past three months, I might not have been writing blog posts, but I have already been working on more woodworking projects for the nursery; so more posts are coming soon!